Smart speakers like the Amazon Echo and Google Home have proved useful -- but they tend not to sound very good. Sure, they're serviceable in a pinch, and are better than most cheap Bluetooth speakers, but they don't compare to options like the entire Sonos lineup, let alone a nice set of bookshelf speakers like the Audioengine A5+. That's slowly changing, though: The Alexa-powered Sonos One speaker performs well and is affordable, while Apple's forthcoming HomePod sounded excellent in a brief demo we saw earlier this year. 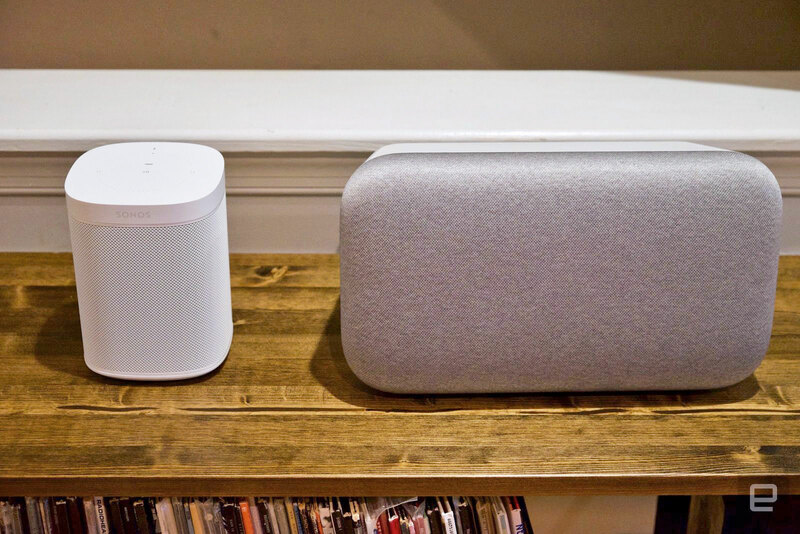 Google's Home Max is the company's first attempt to join the HiFi audio space -- it does everything that the smaller Home speakers do, but with significantly larger and higher-caliber components. Of course, that higher quality comes at a significantly higher price. At $399, the Home Max is more comparable with dedicated, higher-quality speakers. But the Home Max offers a unique combination of simplicity, high-quality audio and voice-activated features courtesy of the Google Assistant. 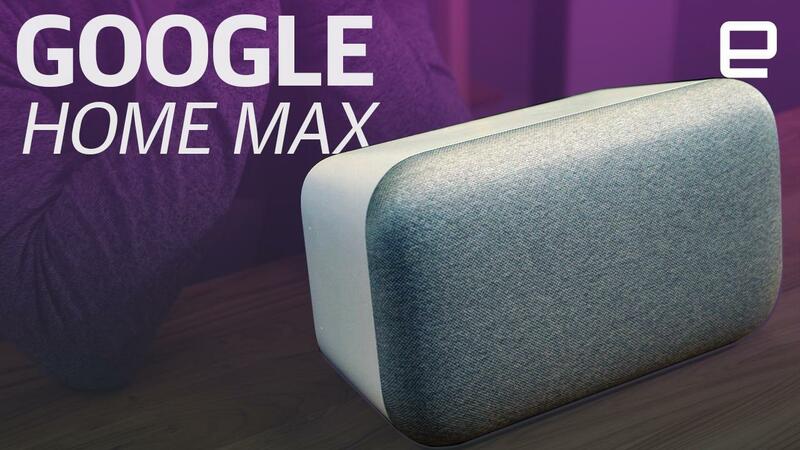 If you're looking for a voice-activated speaker and want excellent sound quality, the Google Home Max is the best option on the market. It's expensive, but you get a lot for your money. If you want great audio and don't want to mess around with more complicated speaker setups, the Home Max is a solid option. Be the first to review the Home Max? The Google Home Max is a large, heavy speaker; it's definitely more conspicuous than the standard Home or Amazon's Echo lineup. Still, it's a charming, attractive device. 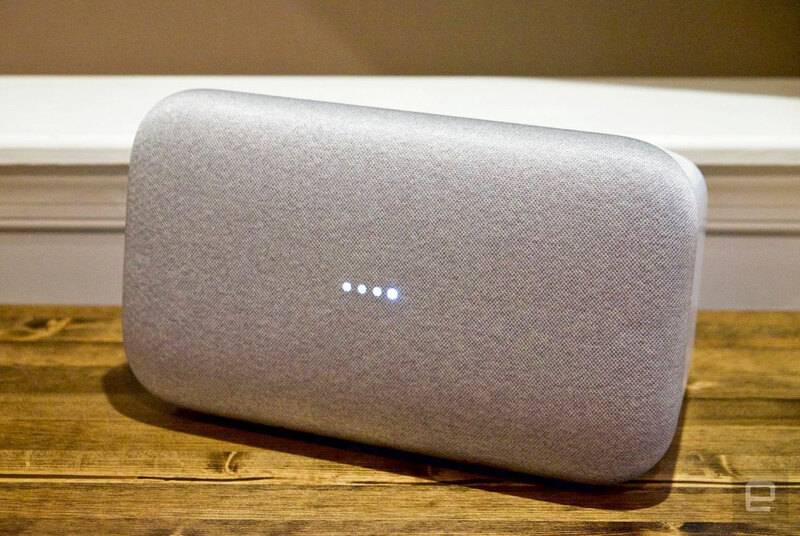 The gently rounded corners and fabric-covered front both bring to mind Google's tiny Home Mini and make it just a bit more "friendly" than your average speaker. It's similar in size to the Sonos Play:5 and just as well-built. Google says it designed the fabric on the front to be acoustically transparent and that it tried several dozen options before settling on the weave pattern. I've never listened to the speaker without the cloth in the way, so I don't have anything to benchmark against, but it doesn't appear to impede audio in any way. There's not much else about the Home Max that's visually remarkable. Around the back, you'll find the mic-mute switch, power jack, a USB-C port and a 3.5mm audio input. It's not clear what the USB-C port is meant for aside from charging your smartphone (Update! Google says you can add a USB-C ethernet adapter for faster internet). But the 3.5mm jack is useful for plugging in a variety of audio devices, from directly hooking up a tablet or smartphone (not the Pixel 2 or newer iPhones, though!) to adding a turntable to your setup. I gave a few records a spin and it worked easily, although I had to use an RCA-to-3.5mm converter I had around. It would be nice if the Home Max had RCA ports, because so many traditional home-audio products use them, but most users will probably be opting for Spotify. The top of the speaker also includes a thin strip of touch-sensitive controls; there's a line to help orient you. Tapping the center of that line pauses or resumes music, while sliding your finger right or left turns volume up or down. I wish these controls included a way to skip forward a track, but the good news is that Google could theoretically add feature this with a software update. What's inside is a lot more interesting. Google packed in two 18mm tweeters and two 4.5-inch woofers, good for driving a lot of volume and bass. There are also six far-field microphones that did an excellent job of recognizing my voice when I was talking to the Home Max, even while the music was cranked up loud. The last detail of note is hidden under the front cloth. There you'll find four LED lights, just like the ones on the Home Mini. They light up in response to an "OK Google" command and turn orange and stay on while the mic is muted. Finally, they provide a visual indicator of the volume level when you're adjusting it on the top touch strip. You won't see the lights very often, but they do a good job providing visual cues when you need them. Setup for the Home Max is the same as Google's other smart speakers. Once plugged in, just open up the Home app on your iOS or Android device and follow a few prompts to connect the speaker to your WiFi network. If it's the first time you've set up a Home device, you'll be asked to sign in to your Google account and train the speaker to recognize your voice. You can also add more users later by having them train the speaker; that way, it can distinguish between you and your significant other when you're asking for calendar details or to play your playlists. Once set up, the Home Max does everything its smaller stablemates can. The Google Assistant's capabilities are well-established at this point. 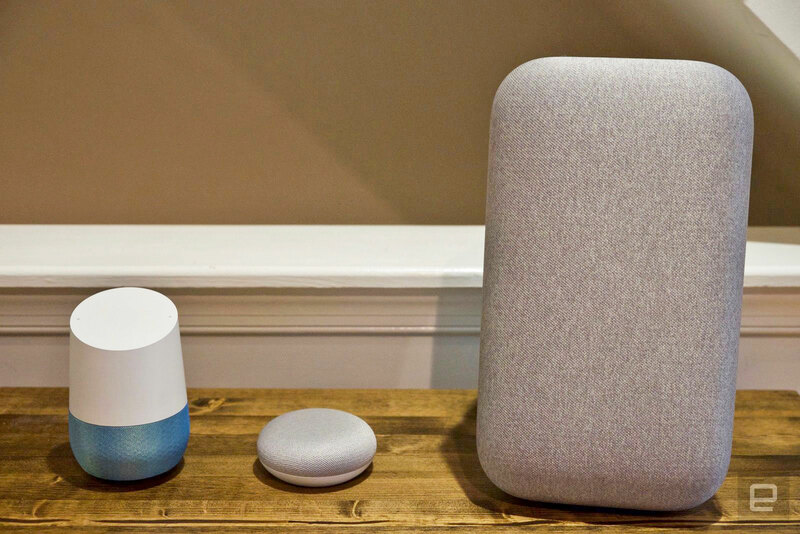 Check out our original Google Home review and our Home Mini review for more details, but suffice to say it can answer queries and searches, make voice calls, pull info like reminders and calendar items from your Google account, control smart-home devices and, of course, play music. Excellent music performance is the entire reason for the Home Max's existence, and it largely delivers. Once you've linked supported music services (including Spotify, Pandora and Google Play Music), you can just ask the Google Assistant to play any song or album that pops into your head. The Assistant is also smart enough to search your library for playlists or stations you've saved. I was able to tell it to stream Discover Weekly from Spotify or a number of different stations on Google Music. The Google Assistant doesn't support nearly as many music services as Sonos, but the good news is that any app that works with Google Cast can be used as a remote to send music straight to the speaker. It also supports Bluetooth, which isn't nearly as elegant, but it's a good workaround if you just can't give up Apple Music. Enough about music services, though. The big question is: How's the audio quality? In a word, excellent. It's the best-sounding smart speaker on the market by a wide margin. Its size and overall performance reminds me of the Sonos Play:5 -- the Max isn't quite as good, but it's also $100 cheaper and includes built-in voice-assistant features. The bass response is excellent, highs are clear without being shrill and it's very, very loud. Pushing the volume above 60 percent really shows off the speaker's chops. Where a smaller smart speaker like the Sonos One can start to struggle, the Max never distorts or loses any bass. This is doubly true when pairing two Home Max speakers in stereo. On its own, the speaker outputs in stereo when horizontal or mono when standing up, but two speakers greatly extend the soundstage. It also makes things even louder, which is entirely unnecessary (at least for my needs). Turning the speakers up also highlighted how good the Home Max's microphones are. It picked up my "OK Google" command phrase no matter how loud things were, something that the Alexa-enabled Sonos One had a lot more trouble with. The Home Max may get seriously loud, but it's impressive even at lower volumes. It's not that often that I listen to music on speakers of this caliber, positioned in a way that I can really experience stereo effects. It even works with my turntable, despite the fact that the speakers had to take the input from one speaker and then split and stream the channels wirelessly. There was a tiny bit of latency between when I dropped the needle and started the music, but that didn't really matter because the speakers stayed in sync without issue. Google has supported multiroom audio for a few years now, and it works smoothly on the Home Max without. You can connect multiple Google Home devices together; Chromecast hardware works with multiroom audio as well. Finally, if you have multiple Google Home speakers, you can talk to one to control others in the network. For example, you can say "turn down the living room speaker volume" to any Home device, and it'll know what you're talking about. The Home Max provides a stellar music experience, particularly when in a stereo pair. Of course, at $800, there's no excuse for anything less. 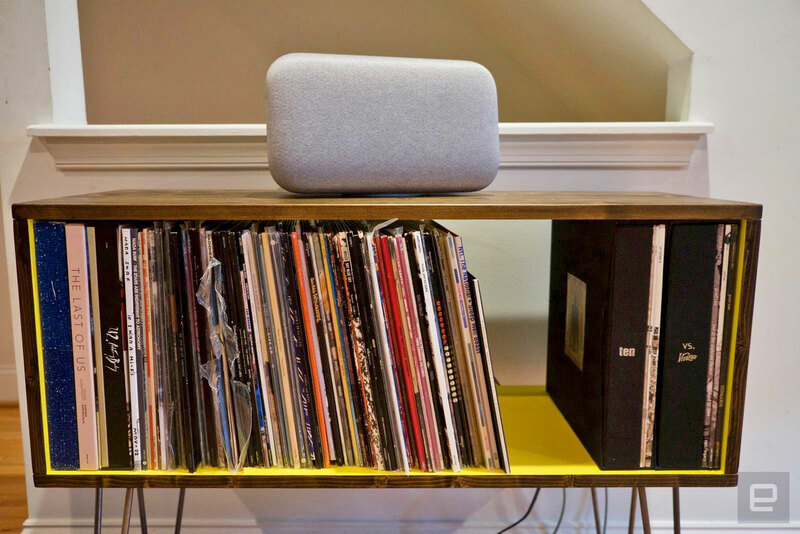 One last note on audio: Google doesn't let users tune their speakers to the room, like Sonos does with its Trueplay technology. 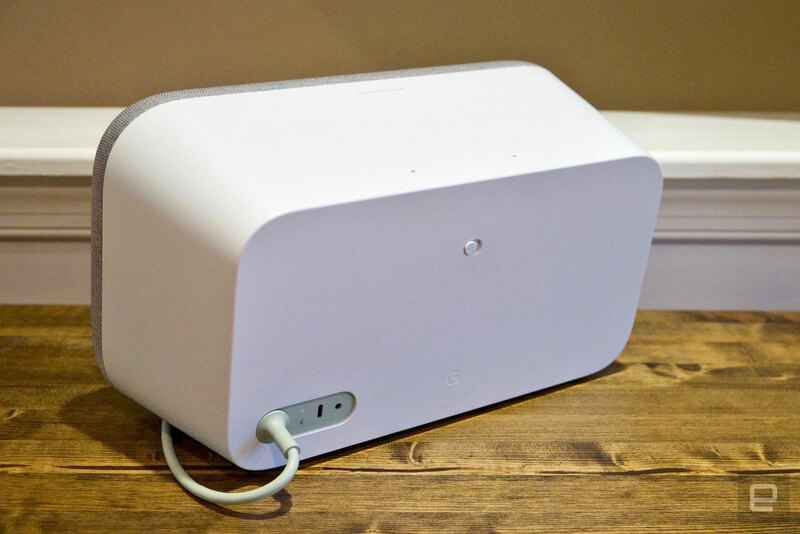 But the company does have built-in, machine-learning-assisted algorithms that automatically modify output to best fit where you place the Home Max. Google calls it Smart Sound, and the first feature that falls under that category is Room EQ. This specifically adjusts for bass output -- lots of people put their speakers in corners or against walls, which typically amplifies bass. Room EQ adjusts this to even things out. It's all done automatically, and the speaker readjusts every time it is moved. There's no way to turn it on or off, so I can't really tell how much it affects the sound, unfortunately. But the bottom line is that the speaker sounds great. Google's Home Max is a bit of an outlier right now. The Sonos One is an excellent, music-focused smart speaker, but it's much smaller. Its performance is impressive given its size (and $200 price), and at lower volume levels it holds up well. But once you push things past 50 percent, the Home Max asserts its superiority. Still, for $400 you could get a stereo pair of Sonos One speakers, or just take two and distribute them at different points in your house for multiroom audio. Another option would be buying two of the Sonos Play:1 speakers, which now cost $150 each but don't have voice control. From there, you can add an Amazon Echo Dot so you can control the speakers with your voice. That'll give you a voice-controlled music setup with solid performance for less money. Of course, it's a bit more complex. If you're really focused on quality, the Sonos Play:5 is another excellent option. It's more expensive and it doesn't have voice control built-in, but it sounds magnificent. And if you prefer the Google Assistant to Alexa, Sonos says it's adding support soon. If you're an Apple fan, AirPlay 2 is coming as well. Again, it's a bit more complicated a solution than just buying a Home Max and calling it a day, but it's worth considering. Apple's HomePod isn't out yet, and it's primarily designed for Apple Music, but it sounded great in a brief demo earlier this year. That said, Apple still hasn't said when it's coming out, and besides, we'll need to test it for a longer period of time before we weigh in on how much we like it. If you're an Apple fan, you might want to wait for the first wave of reviews. Finally, there are many pairs of incredible bookshelf speakers on the market that you can get for around the price of a single Home Max speaker. Add a Chromecast Audio and a Home Mini and you'll have basically the same features as the Home Max, with better stereo performance to boot. At $399, the Google Home Max will not sell as well as the standard Home or Home Mini. 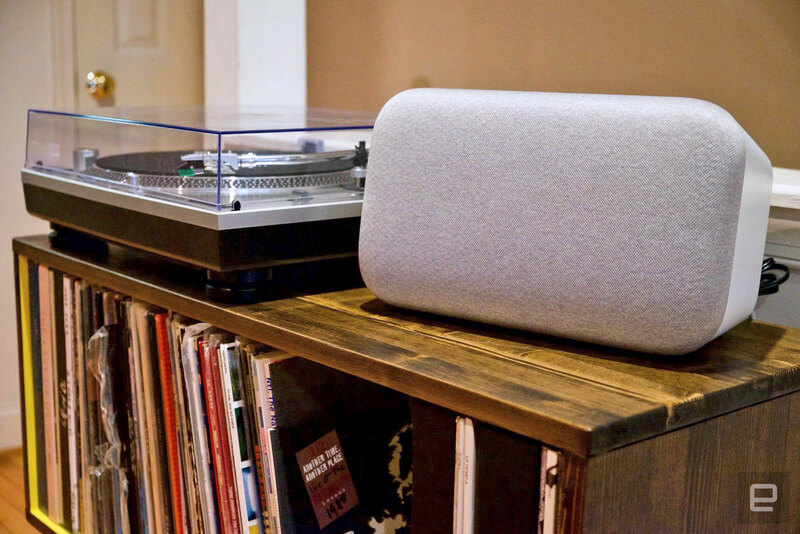 But many people listen to music on those devices, and a subset of them certainly would like to combine the smarts of the Google Assistant while also upgrading their home audio setup. The Home Max fits that bill. It's incredibly easy to set up, it can do everything that the other Google Home devices can do and, most important, it sounds excellent. There are other speakers in this price range that perform better, but the Google Home Max doesn't have any competitors that can match all of its features. It's simply the best-sounding smart speaker available right now. Though the Home Max's price will be a dealbreaker for some, music fans should definitely take note.